Nearly 7,000 circus fans attended the afternoon show on July 6, 1944, and many were fortunate enough to survive the blaze. Here are the names of some of the survivors, and also the names of those who helped or are otherwise associated with the Hartford Circus Fire, though they may not have been in attendance during the tragic performance. Names are sorted by "last name first"; in cases of women who got married after the circus fire, their name in 1944 is used when known. The search function at the top of the each page can also be used to search the entire website for a name or term. Provided a witness statement, seated in bleachers on right side. Went to the circus with her brothers, Eugene and John Daigle, and sister Nanette Backhouse. They all escaped the burning big top. Went to the circus with his brother John L. Daigle and two sisters, Carmella Daigle and Nanette Backhouse. They all escaped the burning big top. Mr. Daigle passed away March 14, 2010. Mr. Daigle was quoted in a July, 1991 Northeast Magazine article: "There was a hole where the tent poles came in. I remember waiting for this little girl to jump before I did. And some guy, an adult, pushed her off because she wasn't moving fast enough. I have no idea what happened to her. I remember looking back [into the tent] and seeing nothing but charred things. For a few days after, anytime anyone talked about it, I got sick to my stomach." aka Beverly (Darico) Addis. Went to circus with her mother Mary Darico, aunt Clara Lutton, and two Kabrick boys. All would survive. (Now known as Frances Bibbes) Attended the circus with her father, and they were sitting in the upper part of the bleachers when the fire broke out; her father told Frances to jump, which she did, causing a small disfigurement to her back which has gotten worse over time. 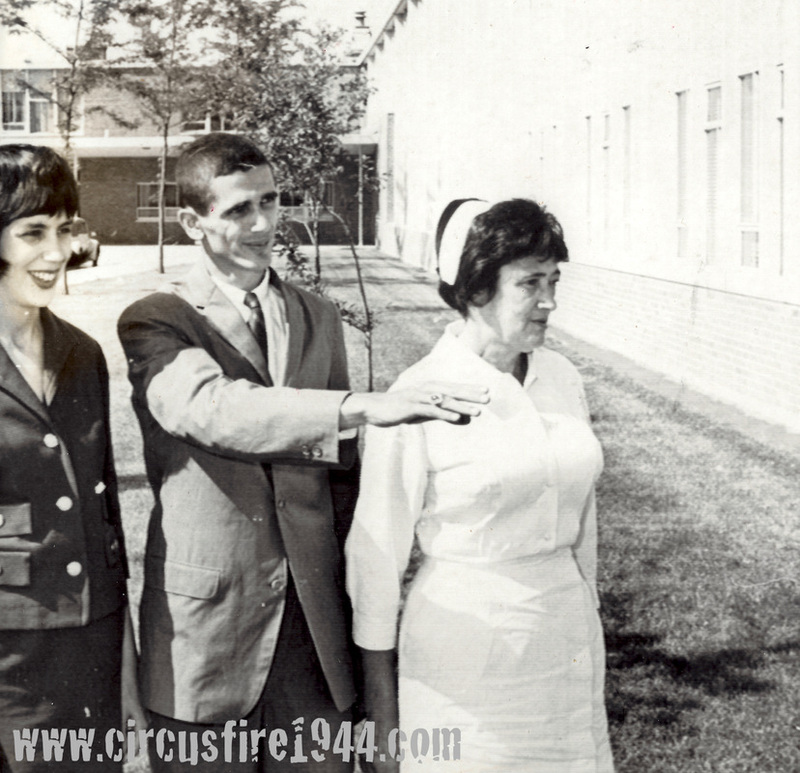 Attended circus with his daughter, Frances Darzentas, and the two were sitting in the upper part of the bleachers when the fire broke out; Mr. Darzentas told Frances to jump, which she did, causing a small injury to her back. Attended circus with his two children, all got out safely. Went to the circus with her friend Nancy W., both escaped without harm. Read Louise's story here: Personal Accounts - Page 8. Attended circus with 9 members of her family - none injured or killed. Attended the circus with his parents Dr. Paul Mason de la Vergne and Elizabeth, and family friend Dr. Lawrence Thompson and his son Jack. The group sat in the top row of bleachers, but Elizabeth relocated to a lower seat due to her fear of heights. The men escaped the tent by sliding down the ropes behind the bleachers and dropping the boys down; Elizabeth never made it out alive. Staff physician at Undercliff, attended circus with his wife Elizabeth de la Vergne, their older son David, and family friend Dr. Lawrence Thompson and his son Jack. The group sat in the top row of bleachers, but Elizabeth relocated to a lower seat due to her fear of heights. The men escaped the tent by sliding down the ropes behind the bleachers and dropping the boys down; Elizabeth never made it out alive. Attended the circus with his older sister Terry DelGiudice. Richard had a bellyache so they walked out of the big top, turned around, and saw that it was on fire. Attended the circus with her little brother Richard. Richard had a bellyache so they walked out of the big top, turned around, and saw that it was on fire. Later known as Theresa Kupisz. Attended the circus with brothers Thomas DeMichele and Victor DeMichele, and aunt Ruth Morrell. All got out safely through a slit in the tent side that someone made with his pocket knife. Attended the circus with brothers Patrick DeMichele and Victor DeMichele, and aunt Ruth Morrell. All got out safely through a slit in the tent side that someone made with his pocket knife. Attended the circus with brothers Thomas DeMichele and Patrick DeMichele, and aunt Ruth Morrell. All got out safely through a slit in the tent side that someone made with his pocket knife. Bradford was a survivor of the circus fire. Mr. Dennler passed away on February 16, 2019. Link to obituary / Back-up link. Was in the circus tent with his uncle when it caught fire. His uncle grabbed him off the bleachers and forced him towards the tent exit. Attended circus with her mother, both escaped without harm. aka Mrs. Rose (DiBella) Pelson. Daughter of Dominic and Mary DiBella. Survivor of the circus fire. Carol (Doyle) Torry died peacefully on July 28, 2014 (link to obituary) (back-up link). Attended circus with her brother Joe Thompson and her mother Mrs. Anna Doyle Thompson and her husband. Judith was slightly burned and was able to return home after treatment. Judith was born in 1934, died in 2007. Married name was Judith Budney. Siblings Betsy and Herbert attended the circus with their mother Rose Dunn, and Rose's friend and her daughter Elinor Lynn. Everyone in the group survived, some with scratches and burns. Attended the circus with his wife and two daughters and a friend. All escaped without injury. Attended the circus with her mother and father Mabel and Cecil Dressler, her sister Marie Dressler, and her friend Tillie Oliver. All escaped without injury. Read LeAnn's story on Personal Accounts Page 8. Attended the circus with her husband and two daughters and a friend. All escaped without injury. Attended the circus with her mother, father, sister and a friend. All escaped without injury. Charles Dustin, his wife Pauline, and their daughter Charlotte attended the circus and sat high in the bleachers. They jumped from the bleachers and exited safely. Read more about their experience here: Personal Accounts - Page 8.